During Google Cloud Next ’19 (April 9-11, 2019) flurry of announcements, a technical detail with significant business impact surfaced. Google Cloud’s new Anthos hybrid and multi-cloud platform depends on VMware vSphere if an IT shop wants to containerize legacy applications that use local storage. Part of why containers and Kubernetes are so portable and easily deployable is that they were originally designed to support “stateless” applications that do not use local storage. An application that does not use local storage is easier to migrate from one server to another and is easier to clean up when it is shut down. But a lot of legacy business applications are “stateful” and rely on local storage. Enterprise IT would very much like to port a stateful applications to containers without completely redesigning those applications. However, that means creating a path between a containerized application and classic enterprise storage. Anthos is built on top of Google Kubernetes Engine (GKE) On Prem. GKE On Prem in turn depends on installing VMware vSphere on prem. Of all the partnerships and initiatives VMware has with all the cloud service providers, this underlying dependence of Google Anthos on vSphere is a uniquely strategic dependence. GKE On Prem’s reliance on VMware vSphere abstracts the storage hardware manufacturer relationship away from Google Cloud. All major brands of data center servers and hyperconverged infrastructure certify their gear to run a range of VMware software products. Hardware manufacturers must certify VMware software on their products to create IT customer confidence in those products. VMware certification is not optional go-to-market support. This strategic detail was buried in a pre-event briefing with Robin Systems and in a Google Cloud Next technical session about GKE On Prem (which further shortens to GKEOP in the session slides). Google Cloud showed vSphere kind of hanging in space in a couple of slides, something I probably would have missed if I hadn’t have talked with Robin Systems beforehand. Then the presentation confirmed vSphere is “currently the default storage class in GKEOP” and even mentioned deploying on a specific version of vSphere (version 6.5). 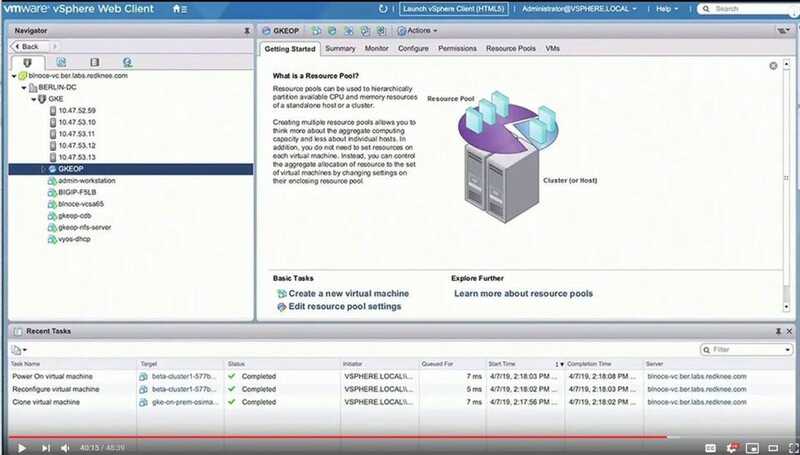 And the live demos leveraged VMware’s vSphere Web Client to configure pools of virtual machines and storage. Because vSphere is the default storage class for GKE On Prem, it is also the default storage class for Anthos on prem containers. I also talked with Partha Seetala, co-founder and CTO, and Radhesh Menon, CMO, of Robin Systems. Their product, Robin Storage for GKE, aggregates all of a customer’s storage registered through vSphere. Robin Storage for GKE then clusters the registered storage for GKE On Prem, forming a pool of persistent storage for applications running in Anthos managed containers. Mr. Seetala said, “using the vSphere ecosystem improves Google Anthos time to market.” Enterprise applications specify how much storage capacity they need and what kind of media, what kind of protections the storage needs, such as replication, and what kind of governance to apply to the storage, such as encryption and privacy controls. For example, by using middleware like Robin Storage for GKE, enterprise application developers do not need to know the details of how storage is connected to containers in their specific enterprise data center to perform a snapshot. They simply ask Robin Storage for GKE for a snapshot. This is similar to one aspect of Microsoft leveraging Dell EMC to bring Azure Data Box Edge to market, which I wrote about in October. Microsoft had a choice of many hardware suppliers that might have successfully fulfilled Microsoft’s edge computing and storage requirements. Microsoft’s decision most likely boiled down to a global partnership with Dell EMC Services. For Microsoft Azure Data Box Edge, the hardware is lightly customized, but the business relationship enables Microsoft to support all the edge deployments. On prem data center hardware support is not something Microsoft Azure should aspire to build from scratch. This GKE On Prem to VMware vSphere relationship means that Google does not have to certify GKE On Prem with every server that enterprise IT might want to run GKE On Prem on. For most IT buyers, certifying that GKE On Prem runs on VMware vSphere is good enough. It pushes GKE On Prem hardware support to VMware and to VMware’s hardware partners. Before anyone gets too worked up about what is open source and what is not, it’s worth noting that Anthos uses a lot of open source projects although Anthos is not entirely open sourced itself. However, it is a little curious that VMware and vSphere are not mentioned on Google Cloud’s Anthos page, even though the VMware logo appears on the page. Kudos to VMware and to Dell Technologies VMware’s parent company. Analysts are continually bombarded by organizations loudly announcing “strategic” deals that are not. It’s nice to occasionally discover a quietly implemented but truly strategic maneuver. This article was written for Forbes, the original article can be found here. PreviousPrevious post:Liftr Cloud Look Ahead: Google Cloud Unveils Anthos, Microsoft Doubles UK Region, and More!